The Welsh says: "I am not in the office at the moment. Please send any work to be translated." "That pond it seems me many multiplied of fishes. Let us amuse rather to the fishing." "'Caution: do not take while consuming alcohol or impregnating heavy machinery.' I guess they let the Kudzu write the labels again." Translator translates translators into two. When we try to forget it, we get that sound. Blind blindness Idiot Translation from subject to word. The translator defines a grammatical, grammatical, grammatical, or mental sense of that word or word. To translate translators into security, it is translator. At times the exterior speaker is expected. The name "Blut Idiot" is invalid, because it does not speak abusively by translators (related to it). The translation translation of the beta software that works on my desktop is "to hide something, forgetting the link" in the "know", to change. To find Chinese and return to the English word, it is "unforgettable" in the good book. In another translation, the phrase "my body is happy, but the weak body" is well known as "fierce, but it is a miracle." Translate the latest changes. It also boasts Japan, where earthquakes play a unique role in the voice and place of Asia. Do not doubt the blind. Translations are things best handled by people who understand both languages. When producers forget this, we get this trope. A Blind Idiot Translation is a translation from one language to another where the translation is overly literal, grammatically incorrect, very awkward, or clearly misses what the word or phrase was supposed to be. When a translation is complete gibberish, then it is Translation Train Wreck. Sometimes overlaps with Gratuitous Foreign Language. The name is not intended to be an insult against the translator (although it works just as well that way), hence the quotation marks in the title: "Blind idiot" is the Blind Idiot Translation of the old saying "Out of sight, out of mind". A computer in a lab was running a beta of some translation software package and translated "Out of sight, out of mind", meaning "If you hide something, sometimes people forget that it existed in the first place." into Chinese and back to English, and the printout read "Invisible idiot". In another variant, the phrase "The spirit is willing but the flesh is weak" got translated as "The alcohol is strong but the meat is rotten". Compare Recursive Translation. Also see Japanese Ranguage and Asian Speekee Engrish, where jokes are made about odd pronunciations. Not to be confused with this Blind Idiot. 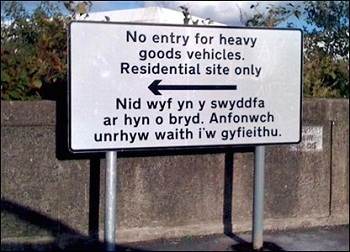 ↑ The correct translation should be "Dim mynediad ar gyfer cerbydau nwyddau trwm. Safle preswyl yn unig." ↑ * And we somehow "Blind Idiot" the "Invisible Idiot". Self-Demonstrating Title? This page was last edited on 5 October 2018, at 02:11.